In the early morning hours of August 4, the Hanover County Sheriff’s Office notified the United States Marshals Service of a possible location of homicide suspect Justin Valentino Mason. The U.S. Marshals Service located and arrested Mason in the City of Richmond without incident. 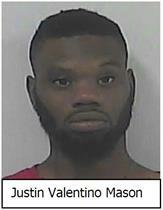 Mason, a 25–year-old resident of Richmond, was charged in relation with the June 27 shooting death of 30-year-old Craig Michael Bates, which occurred in the 1500 block of Mickie Town Road. He has been charged with first degree murder and use or display of a firearm in the commission of a felony. Mason is currently being held at Pamunkey Regional Jail without bond. “I am proud of the efforts of our investigative team and the efforts of our law enforcement partners in the region including the U.S. Marshals Service for their efforts up to this point. Although an arrest has been made, we will continue to make sure all evidence is identified to ensure support of a successful prosecution,” said Colonel David R. Hines. using the keyword “iTip” followed by their tip. Both Crime Stoppers methods are anonymous. ⇐Previous National Night Out A Huge Success!Next⇒ National Night Out 2015 is Here!